You might have seen our treehouse post yesterday? 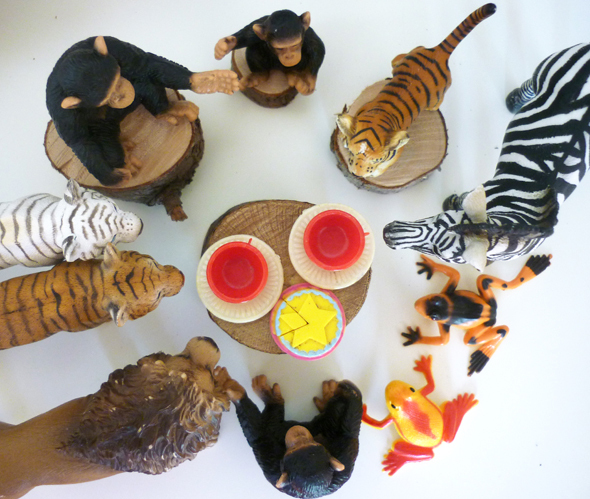 Needless to say, the jungle animals have been enjoying many impromptu gatherings in and around their tree house over the past few days! What I love about open ended toys, is their capacity to encourage a diverse range of play experiences, limited only by the child’s own imagination. And so our doll house tea cups and birthday cake fit just as nicely into playing jungle tea parties as they do a party in the doll house, and Immy regularly takes toys from one set or area and ‘repurposes’ them in another – imagination and creativity in action. How does your child ‘repurpose’ their favourite toys in new ways? Be sure there is a link back to childhood101.com within your post. My boys aren't terribly interested in open-ended toys, believe me, I tried. They do however surprise me with the extent to which re-purpose their character toys. They love to combine their Pokemon cards, Bakugan, Transformers and Ben 10 aircraft to make up quite elaborate scenarios and games. Maybe it's a boy thing? I could be, Dorothy :) If they have a real passion for these characters then it is no wonder the toys are so prominent in their play. I'm so excited when I see my girls using toys from one set with a different set of toys. Yay for crossing over. Currently lots of our dolls house, littlest pet shop and lego toys are getting mixed and matched. My kids love to repurpose toys and just about anything to suit their imaginative endeavors and construction ideas. Just today, I posted about their doing so with pool noodles as hockey sticks! I'm starting to think that toys are over-rated. I swear my sons would have just as much fun playing in a pile of dirt as they would with a $30 toy. Thanks for sharing all the great ideas!